Here is the list of Best Free Internet Cafe Software For Windows. These free Internet Cafe manager software let you manage customer terminals (clients) of your cyber cafe from a single controlling PC (server). The options that these software provide, let you manage as well as monitor client terminals, along with various other options that you will get to know here. Some of these software provide same installation file for Server and Client installation, while some provide separate files for Server and Client installation. Install Server and Client programs on respective PCs. You have to make sure that all the PCs are connected to a single network. The Clients automatically show up on server dashboard in most of the cases, but sometimes you may have to send request to server from client terminal for connection. You will get to know about client-server installation for each software mentioned. Talking about the features of these free cyber cafe software, you can add members, set tariff rates, add products, add services, create tickets/vouchers, generate custom reports, and much more. These cyber cafe manager software also let you keep an eye on session duration, session start time, add time to session, monitor session, remotely control terminal, etc. There’s a lot more that can be done with the mentioned free internet cafe software with the configurable options they provide. Go through the article to know more about them in detail. You can also checkout the list of best free Face Detection Software, Monitor Calibration Software, and Drawing Software For Windows. PanCafe Pro is a completely free internet cafe software. It easily lets you manage and monitor multiple computers set up in an internet cafe environment. 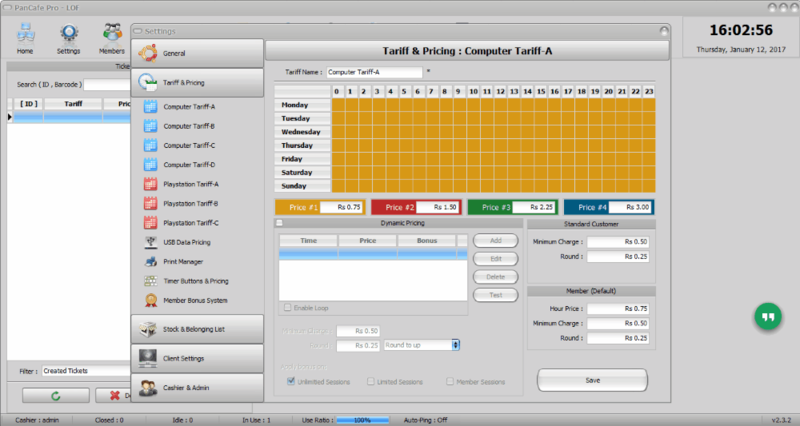 This free internet cafe manager software provides a whole lot of tools and features to control sessions, manage revenue, manage orders, manage tariffs, monitor sessions, and much more. This software can be installed both as Server or Client. Install Server on the PC from which you want to manage all the computers of the internet cafe and install Client on the rest of the computers. Make sure that the Server and Client computers are connected to the same network. Connecting Clients to Server is easy, which requires simply searching for Server once Client is installed, and sending Server a request for connection. Once a Client is connected to Server, the connections is established automatically whenever the Client PC starts. Manage Members: You can add members who will use your Internet Cafe regularly. Member description can be added, such as: name, password, photo, tariff, etc. For a member, you can add a Tariff plan, add balance, and view session history. Manage Tickets: You can add tickets for a certain amount of price with session minutes added to them. For a ticket, you can define Tariff, expiry date, multiple sessions for one ticket, or create a promo (free) ticket. You can also manage all the tickets that have been created. Manage Cash: This option lets you register all the monetary transactions, whether Cash or Credi Card. You can also add a comment to a transaction. All the transactions can be viewed at a single time and sorted according to date, time, and type with this free internet cafe manager software. Cafeteria: This is an optional feature that you can make use of, in case you serve food and beverages in your internet cafe. Under Settings option, you can add items for your cafeteria, which can later be accessed in the Cafeteria menu. This option lets you add orders for a particular Client terminal. Clients can also order cafeteria items directly from their terminal. Report: This menu lets you generate custom Cash report, Session Report, Cafeteria Stock Report, and Member Report. A report can be viewed, exported, or printed using this Internet Cafe Software. Cashier: Add Cashier and their roles here. Cashiers can be given access to custom functions on Server. Settings: Here you can set parameters for almost anything from themes, network settings, terminal settings, tariffs, pricing, cafeteria items, cafeteria stocks, Client settings, and much more. Under Client settings, you get options to change session settings, ban a program, close a program, remotely control client computer, add filter words, and hide/protect files and folders. On the other hand, Client PC interface of this Cyber Cafe management software has very few options. When a customer has to use a client terminal, member login credentials can be used to login. If you are not a member, you can send a login request to server, use a ticket to login, or administrators can login too. Once a session starts, the session stats are shown at the right hand side of the desktop. You can view session start time session duration, orders, and usage cost. A customer can use the interface on the desktop to call a clerk, send message to server, and give cafeteria order. All in all, its a very feature rich internet cafe manager software and takes care of almost every aspect of a cyber cafe. KStreet is another full fledged cyber cafe software for Windows available for free. It has all the options to manage an internet cafe along with all the customer terminals. Monitor terminals, control terminals, add users and members, set price plan, add products and services, transfer files, chat, and do much more. Lets see how to use this free internet cafe software. Separate Server and Client installation files are available on its website. After you have installed server and clients, all the client terminals will show up automatically on the server dashboard. On the dashboard, you can monitor terminal session statistics in real time. If customers wants to use terminal, they will have to login using their member ID and password or they can request for a session to the server. When the session begins, a new pop up window opens with session details, such a: start time, total time, price, product, and total bill. A customer can also request for a print job, chat, or file transfer to server. Stop a session, add a product/service sale to a session, transfer session, set session time, and file transfer to client terminal. Add members along with detailed info, ID, photo, address, etc. 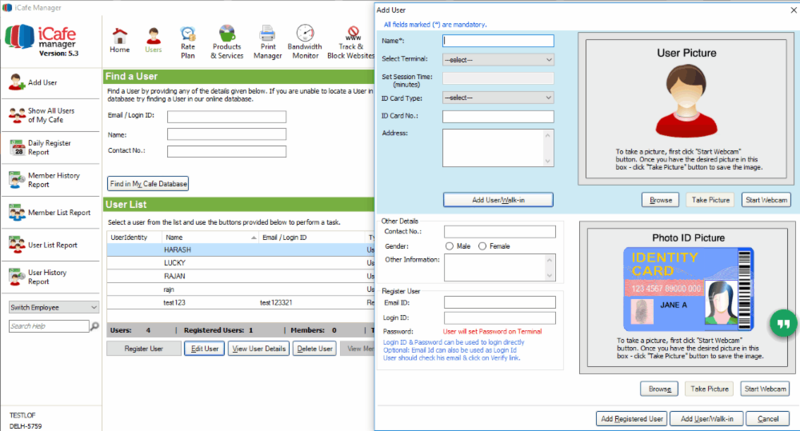 Create a voucher with session time and expiry duration. Manage wait queue, in case customers are waiting for their turn. Set a price plan for customers according to session duration. Set speed limit for terminals. Add list of blocked websites that customers cant access or trace the usage of a selected set of websites. Generate custom reports for daily usage, members, users, and much more. Schedule backup for server and customer terminals. There’s much more that you can do with this free internet cafe manager. Its absolutely free to use and I think you’d like it. NetCafe is a very simple and free internet cafe software for Windows. Just like PanCafe Pro, it can install both Server and Client software from a single installation file. You can manage and monitor all the client terminals right from the server. After you have installed the Server on the main computer, you will have to install clients on the user terminals. All the computers need to be connected from the same network. The client terminals show up on the server dashboard as soon as you install them. While installing Client, you will have to configure TightVNC server configuration. TightVNC comes bundled with the Client installation file. During configuration, you will have to set Server Incoming Port and select Authentication options. On the server, you can handle various aspects of this cyber cafe manager. Along with handling client terminals, you can manage things like: Users, Members, Payments, Reports, Cafeteria, Filer keywords, and much more. View session start time, duration, pre payment options, active window, and remaining time. Shut down and restart terminal. Monitor terminal, remotely control terminal, and control volume level. Once a session is terminated, a pop up screen on the server is displayed withe the client terminal name, session duration, and billed amount. Under the Tools section you can easily configure settings of this free cyber cafe manager. iCafe Manager is another free cyber cafe manager software for Windows. It has a wide array of features to manage cyber cafe terminals, which makes this free internet cafe software a desirable pick. Options to manage all connected terminals from dashboard, create and manage users, create rate plans, add miscellaneous products and services, monitor bandwidth, block a set of websites, generate tickets, generate reports, and change various settings are available here, all for free. To use this software to manage your internet cafe, you will have to download Server and Client installation files separately from its website. Server program has to be installed on the main controlling computer, while Client program have to be installed on all customer terminals. Once you install the Client program and restart customer terminal, the Clients will automatically show up on the Server interface. The server lets you monitor terminal sessions and displays the session duration. Real time monitoring and control of client terminals is not available here, but you get the option to Stop a session, Transfer a session to another terminal, and set session duration. Lets checkout some of the features and what iCafe cyber cafe manager is capable of. Home: The Home tab displays the connected terminals. For each terminal, you can view the session time, internet usage, services used, and user info. While a terminal is in session, you can only close, transfer, and set duration. When a terminal is not in session, you can add a user, enable power saver mode, shutdown terminal, restart terminal, close iCafe client, and view terminal remotely. Users: You can add Users for your internet cafe, where you can enter user info, login details, photo, ID details, and much more. Non users can also carry out sessions on client terminals. Rate Plans: This free internet cafe manager lets you define rate plan for different time duration. This rate plan applies to all customers and users. Products and Services: In case your cafe has to offer some products and services, you can add them here along with price. This lets you add the product to a session and makes it easy for you to collectively bill a customer for the services used. Track and Block Website: iCafe manager is a free cyber cafe manager with options to block websites. You can add a list of websites that you do not want your customers to open. Website tracking helps you with tracking when a listed set of websites were opened in a defined number of days. Tickets: Generate tickets that a user can use over a period of time and you can also add balance to a ticket. All the tickets generated can be tracked. Report: This section of this cyber cafe manager is really important, as it lets you generate various reports. You can generate Daily Register report, Collection report, monthly collection report, user list, purchase report, user history report, and much more. There are various other features of this cuber cafe software that you can make use of. Message broadcaster, shutdown all terminals, notice board, and miscellaneous settings are a few to name. Talking about the Client terminals, when its activated, its interface floats over desktop and requires a customer to login to access the computer. If you are a registered user, login with your ID and password. If a customer is not registered, they can simply start with entering their name. Session will start with the name and the information regarding it will be displayed on server. Admin Login is also available. Once a session is terminated, session statistics are displayed, such as duration, products used, total amount to pay, etc. Note: This free internet cafe software is developed in India. It has various language options; however, the Rates can only be configured in Indian currency. If you are not in India and want to use this software, you can ignore the currency symbol used and configure rates according to your currency. MyCafeCup lets you manage internet cafe pretty easily. It does not have much complex options, still it lets you monitor and manage client terminals without any hassle. Here you can add members, define rates, view session statistics, generate reports, and much more. The Server and Client installation options are included in a single installation file. You just have to choose if you want to install server or client. Clients get automatically detected on Server interface. From the dashboard, you can easily manage all the cyber cafe management related options. In order to start session on a client PC, a member login is required, or you can add session time to a terminal right from the server. On the server, click on a client PC name to view user detail, session statistic, and payable amount. Add on time can also be added to a terminal. Advanced real time monitoring and control options are not available. You can only restart, log off, or shutdown a computer from server. Add users, add members, and define rate trend according to session duration and time of day, right from the server. Custom reports can also be generated on this free internet cafe software for income, daily sales, user activity, coupons, and tickets. 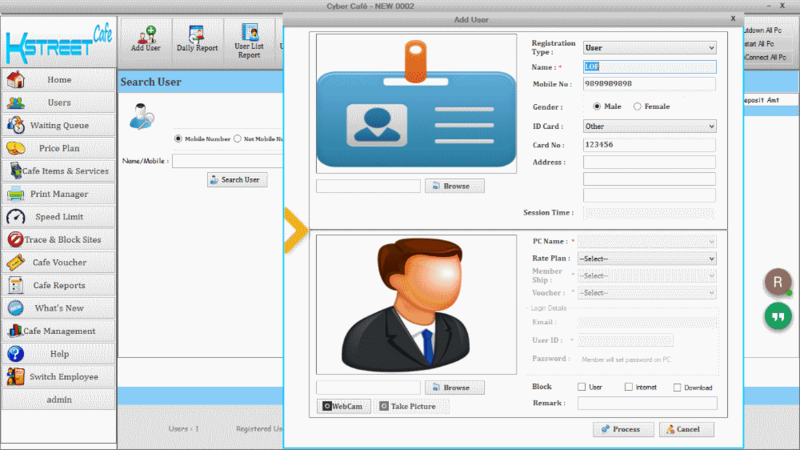 This is a simple and easy to use cyber cafe manager, which can be used in case advanced monitoring is not required. Though the free version is an evaluation version, there are no limits and restrictions for the use of this cyber cafe software.